Double side goring and back tab for easy entry. Great bootie - slightly narrow. The color is listed as olive suede, although it's more of a camel color. It's a beautiful boot but it runs slightly narrow, so you may want to consider ordering a half size up, as I did for my second pair. I would definitely recommend the Landsman Bootie. It has a stylish appearance and a comfortable fit. I'm very happy with it... Looking forward to cooler days! Simply Amazing! I’m an elementary school teacher then I teach adults in the evening. So I’m on my feet ALL day. And these cute little boots were heaven on my feet. Felt like I was wearing sneakers. The appearance of the shoes are super cute, they are well crafted, true to size (8 1/2), super light and the color isn’t to dark. Great investment, I would definitely recommend them. They're cute! I usually expect some discomfort from booties. They weren't perfect (hence the four stars) but they're definitely better quality than most and your feet aren't in debilitating pain after wearing them for a day. That can't be said for some shoes. Love the color and the size of the heel. I've been waiting for these boots to come back for years! Super practical and will be in style forever! I live in Oregon. I need these boots! Stylish and functional. I ordered my normal size 8; these are a little snug for my slightly wide feet however they seem like they'll soften a little with wear. Love the heel size, enough to give me some lift but not too high. I like the color and simple style of this shoes. I’ve been a fan of Cole Haan for years, and I love this particular style of boot. Remind me of boots I used to have that I loved and fell apart. The color is perfect. 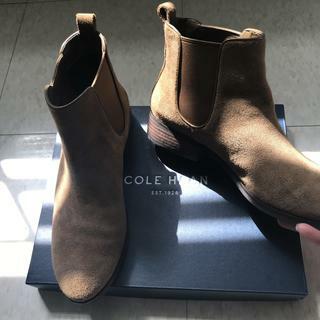 Been wanting a Chelsea boot for a while, this one was a good price and Cole Haan quality is always good. I need some brown boots and I like the looks. For wife, nothing similar in closet. Love suede! Great casual boot. Love the shape and color - very versatile. perfect for Houston's cold weather. These boots are a wonderful quality. I love the style. Look comfortable and super cute. Bought these last year...and i'm buying them again this year! I always get compliments whenever I wear it and they run true to size. Love these shoes soooo much. They're really well made and i'm only buying one as a back up for the future. Is the olive suede color definitely a green color or is it "brownish"? BEST ANSWER: It's about as khaki as you can get. Distinctly "green". Great colour and i wear them with everything. It's not green at all, it's brown. It's more of a camel color than a green. BEST ANSWER: The heel on this bootie is approximately 1" high. I've never had a pair of Cole Haan's, so wondering what size to order. I wear an 8.5, or 9, so not sure which to order in this boot. Any recommendations?